Description: "Noted for repeatedly incurring yellow cards for removing his shirt after scoring." Seems to have forgotten how to perform this trait in the pre season. 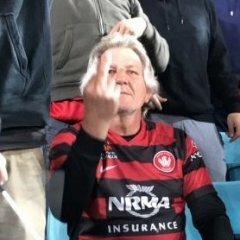 Must have something to do with the stern talking too he received from a couple of avid Wanderers supporters in the car park after an open training session. Alright. At the risk of being decimated by Balkanite, I'm gonna say it. Why the **** is this man not starting over Dino? ok, ill withhold the numerous bad words that came to mind! Sorry buddy, had to be said. The thing is that Dino was pretty woeful tonight, and Haliti scored... Haliti has played markedly less games, and scored more times... I know that its not all about scoring, and Dino does a good job in hold-up, but is it not time to give Haliti another chance starting? Im not saying starting Haliti is a bad thing, but when we have it hasnt really turned out to well where as when we put him in as an impact player, he comes in and makes a mockery of the opposition, scores, celebrates and gets a pointless Yellow Card! Not a fact, just something I've heard through the grapevine, but I think he is a lazy trainer. He is also the sort of selfish player who gets booked for stupidity, like removing your shirt after scoring. This stage of the season, I can forgive as he won't get enough yellows to get suspended, but there are a couple of reasons that may contribute to him not starting. So saying, I do agree that Dino was certainly not at his best on the weekend and Labi has played quite well every time he has been used this year. DINO! DINO! DINO!!!! .. couldn't help myself! ZOLA!!!!!! did i meet you at the pub last game? Yeah mate. Saw your popa flag (which incidentally looks nothing like popa) and couldn't help myself. ahahahaha .. nice to have met you bro! Okay, Labinot has flown under the radar long enough. I'm not saying he needs to start in every game from now on instead of Dino (otherwise Balkanite will issue some kind of Croat fatwa on me) but Haliti has arguably drawn ahead of Gibbs as the back-up striker. He obviously has a better instinctive touch than big Dino with the ball at his feet but he doesn't have the physical presence DK has. Actually Dino wasn't bad, but he just wasn't fast enough to threaten the Marinators defence. There was that half decent run down the left flank in the first half which ended badly, and I bet the big old lunk had a hard time tromping through the slush. Conceding the penalty was a nightmare of course...let's see how he pulls up physically before putting Labinot straight in against Wellington. Actually Dino wasn't bad, but he just wasn't fast enough to threaten the Marinators defence. I have to agree here Manfred. I am not even talking about the game last week either. Sure he scored against CCM, but the last few weeks he has come on he has done his job very well. A little bit unlucky he hasn't had more game time. He is really pushing hard for a starting spot. I dont think he has re-signed! At the risk of turning yet another thread into a 'Balkanite/Dino Love-fest' DK isn't lazy and he has to my mind improved his feet/ball skills immeasureably since those early horrid rounds. Labinot has always had a good deft boot and has worked some great finishes (as his tally of 3 goals show). And again, at the risk of a Croat fatwa Dino couldn't have scored that goal that Haliti took up at Blue-Choke. 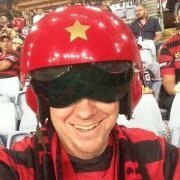 Yet when I watched Dino dribble the ball up the sideline looking to get past the defender I thought 'Onya big Dino' (and waited for the barely suppressed orgasmic cry of a almostsatisfied Balkanite all the way over in the RBB lol). i've been very impressed with haliti this season, but i don't see him as a regular starting player. he's great back up for dino/bridge/hersi (and possibly ono) should they get injured, as a player coming off the bench to make an impact (i think they call them "impact players" but correct me if i'm wrong) he should be second picked on the bench after the mighty tyson. He must be re-signed! Surely his goal on the weekend cements a contract with the Wanderers. Description: "Noted for repeatedly incurring yellow cards for removing his shirt after scoring. "Seems to have forgotten how to perform this trait in the pre season.Must have something to do with the stern talking too he received from a couple of avid Wanderers supporters in the car park after an open training session. >Description: "Noted for repeatedly incurring yellow cards for removing his shirt after scoring. "Seems to have forgotten how to perform this trait in the pre season.Must have something to do with the stern talking too he received from a couple of avid Wanderers supporters in the car park after an open training session. ahahah you think that was me blasting you? .. remember my friend i withheld my comments due to you being "New" here. Didn't come across right , I was thinking you were going to blast me but you didn't so I thanked you . Then I took the piss ! LOL, all good buddy ... as im sure you have seen im unofficially Kresingers biggest fan. Awesome celebration I'd love to see more of Haliti. At least instead of Gibbs. He just seems to have a natural talent for positioning as well shooting. Have seen some great shots on target by him. Haliti definently brings something different to te squad. Hes not always clinical but hes got a great shot on him, pace and is a predator around the box. Untill this seasOn hes shown abit more hunger and work rate. For me hes like a Le Fondre for Reading with his impact. Hes abit of a luxary player, but we have a good system and structure to be able to compensate for his in the team. He should make the bench more often and be rewarded with some more regular starts, such as those which were given to Gibbs. I like Gibbs but Haliti is ahead of him in the peckin order now IMO. Id definently like to retain Haliti for next season as a squad player at the very least.